Abdulla Mohammed Al Awar is the CEO of Dubai Islamic Economy Development Centre. Prior to his current role, Al Awar was the CEO of Dubai International Financial Centre for the period from 2009 to 2012. During his overall 8-year tenure with DIFC that saw him hold various executive positions, he leveraged his exceptional skills in strategic planning, operational management and financial control to help develop DIFC into a global financial hub. Under his strategic leadership, DIFC was ranked as the leading financial centre in the region for the years 2009-2012, demonstrating an average 13% client growth year on year and improving the organization’s efficiency and performance. 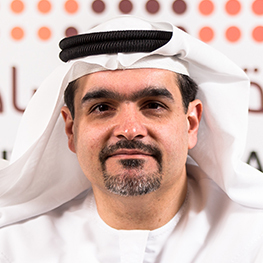 Al Awar has served as member of several committees and boards in Dubai including the Economic Committee of the Executive Council of Dubai, Dubai Free Zones Council, Bourse Dubai and the Investment Committee of the Emirates NBD Real Estate Fund.Al Awar holds a Bachelor of Science Degree in Business Administration from the University of Colorado at Boulder, US. He has also graduated from the Mohammed Bin Rashid Program for Leadership Development, an executive education program, through affiliation with Cranfield University, UK, IMD and INSEAD.